This course will introduce students to the manufacturing methods, publishing practices, distribution networks, and reception and use of books, periodicals, and other printed materials in the United States during the industrial era, roughly from the 1820s to the 1940s. Particular attention will be paid to exploring the introduction and impact of the new industrial production technologies that defined the period, but other topics to be addressed include: the rise of trade publishing and other publishing systems; methods of book distribution as the book market expanded across the continent, especially the role of bookstores; reading, readership, and the ways in which readers acquired and used books; and the importance of the international trade in American and British books and texts both before and after the 1891 international copyright law. The Rare Book School teaching collection is especially rich in printed materials from this period, and students will have an opportunity to study multiple examples that illustrate important features of the history of the American industrial book; copies of some manuscript material will be also be available to illustrate the business practices of book manufacturers and publishers. Students will also be introduced to important reference works and other resources for the study of American book history and are encouraged to discuss their own research projects with the instructor and class members. The course is aimed at scholars, librarians, collectors, and others whose work or research requires particular knowledge of the American industrial book and, thus, it is intended for those who already have some familiarity with book production methods and American book history. It serves as a chronological sequel to James N. Green’s History of the Book in America, c.1700–1830 (H-70) and supplements at a more advanced level the broad overview offered in the introductory course The History of the Book in America: A Survey from Colonial to Modern (H-15). In their personal statement, applicants are requested to summarize briefly their background in the field, current research projects, and topics or issues that they would particularly like the course to address. Michael Winship teaches this course, as "The American Book in the Industrial Era, 1820–1940." 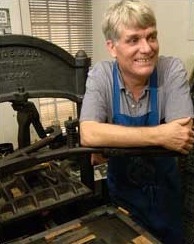 Michael Winship teaches this course, as "The American Book in the Industrial Era, 1820–1914." Michael Winship teaches this course, as "The Book in the Industrial Era, 1820–1914." Michael Winship, Iris Howard Regents Professor of English II at the University of Texas at Austin, edited the final three volumes of the nine-volume Bibliography of American Literature. He is the author of American Literary Publishing in the Mid-Nineteenth Century: The Business of Ticknor and Fields (1995) and has published widely on the nineteenth-century American book and publishing trades. He is an editor and contributor to The Industrial Book, 1840–1880 (volume 3 in the History of the Book in America series) and served on that series’ editorial board. He has taught annually at RBS since 1983.